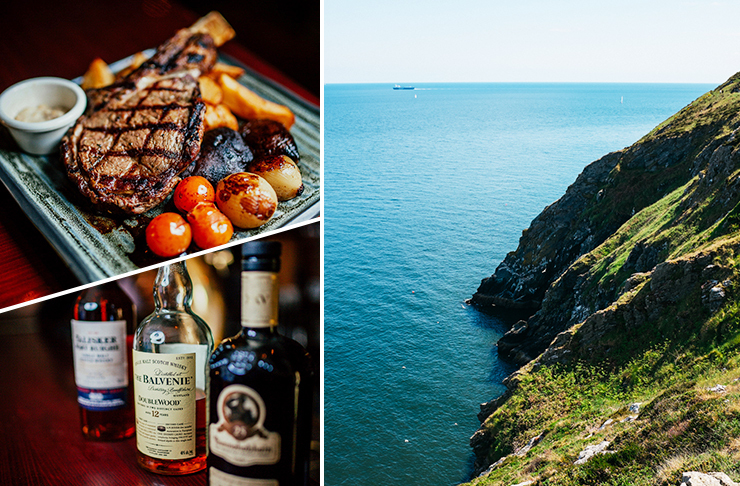 Ireland is a fantastic place for discovering everything from mythical legends to your new favourite hearty dish. With epic castles around every corner (you know they filmed Game Of Thrones there, right?! ), some of the world’s best whiskey, beer and live music venues, and stunning scenery that simply HAS to be seen to be believed, it’s a nation that should be placed firmly at the top of every globetrotter’s bucket list. At the heart of the Emerald Isle’s tourism hotspots lies Dublin, a city with an incredibly infectious culture that embraces the arts, food and drink, and ‘great craic’ (that’s local speak for having a good time with your mates). This makes the bustling historical city one of the hottest destinations on Emirates' global network which includes 38 European cities—and with great flight connections to Dublin from Australia via a quick stop in Dubai, it’s no wonder more Australians are heading over there. Want to know what to do when you get there? Check out our top 50 things to eat, do and see in Dublin. 1. Have a pint o’ the black stuff at the Guinness Storehouse. Slainte! 2. Check out some amazing art at IMMI, the Irish Museum of Modern Art, which has an incredible cobbled courtyard at its centre. 3. Watch the Irish team scrum down—that’s rugby, you non-sporty folks—at the Aviva Stadium. 4. Try some firewater, aka. whiskey, at the Old Jameson Distillery, where they’ll tell you why there’s that extra ‘e’ in all Irish whiskey. 5. Really get to know the in’s and out’s of the oldest whiskey producing country in the world at the Irish Whiskey Museum. 6. Eat a full Irish fry at Violet’s Restaurant, Drumcondra, and fall into a food coma. 7. Bask in the Irish sun, if you’re lucky enough to see any (! ), while lounging on St Stephen’s Green. 8. Watch the Irish Gaelic team punt a goal at Croke Park and discover the true roots of AFL. 9. Pick up some of the best potatoes, veggies, cider and more at the Dublin Farmers Market, which runs every Wednesday. 10. Take part in some Bloomsday celebrations in honour of writer extraordinaire, James Joyce, in June when local literary buffs read his masterpiece, Ulysses, aloud from start to finish. 12. …Then head to Tengu Izakaya, hidden behind the restaurant, where you’ll find pool tables, ping pong tables and DJs all night long! 13. Book in for some amazing local theatre at the Abbey Theatre. 14. Sample the local chocolate at Butler’s Chocolate Café, where they literally sell bags of happiness. 15. Go looking for the last of Ireland’s snakes at St Patrick’s Cathedral, where you will find some of the most beautiful architecture in the city. 16. Do a bar crawl along Temple Bar, the most famous strip of pubs in the city, which runs along the south side of the River Liffey. 17. Discover the weird and wonderful things we love the Irish for at the Little Museum of Dublin. 18. Try some freshly shucked oysters at seafood eatery Klaw in Templebar. Delish. 19. Make like a local and pick up a copy of Hot Press from a news stand for all your music news. 20. Sample some amazing craft beers at the Porterhouse, including their own house-brewed stout. 21. Sip on the best coffee in the city at 3Fe, Dublin’s top coffee roastery that hosts tasting classes as well as serving breakfast and lunch. 22. Take part in a trad session (that’s an evening of ‘fiddle-dee-dee’ music) at The Cobblestone, in Smithfield. 23. Eat all the scones at Queen of Tarts, one of Dublin’s most drool-worthy bakeries. 24. Get zen at reggae yoga for only €5 at Wigwam, an awesome space that doubles up as a café, bar and nightclub. 25. Find out where the leprechaun myth really came from at the Irish Leprechaun Museum. 26. Catch the next global Irish songwriting superstar at live music venue Whelans on Wexford Street. 27. Hit Dublin Flea Market for some amazing art, crafts and vintage finds. 28. Get ready for a good ol’ laugh at The Comedy Cellar, where Irish comedians including Dylan Moran started their careers. 29. Pick up a paperback at the Temple Bar book market, which runs every Saturday and Sunday. 30. Try the Guinness stew at O’Donoghues pub, which was opened in 1879. 31. Peek inside distraught artist Francis Bacon’s studio at the Hugh Lane Gallery, who have recreated the entire studio after it was donated to one of the gallery’s benefactors. 31. Dance until dawn at District 8, one of Dublin’s best electronic music venues, which takes its name from its Dublin postcode. 33. Eat your own body weight in cheddar mash at The Winding Stair restaurant, which also serves one of the best steaks in the city. 34. Jump on a bike share bicycle and explore the city’s cobbled lanes on two wheels. 35. Sip on an incredible cocktail (we’re talking everything from 1400’s classics to brand new house signatures) at the Vintage Cocktail Club, just remember to book beforehand! 36. Get out of town and check out some real mountains in the Wicklow Mountains National Park. 37. Go for foodie broke at Chapter One, the Michelin starred restaurant in Parnell Square. We’d recommend booking in for the full tasting menu and arriving hungry! 38. Check out an open air film at Happenings pop-up al fresco screenings. 39. Take a selfie with the bronze statue of music legend Phil Lynott of Thin Lizzy, which is on Harry Street. 40. Splash some cash on Grafton Street, a shopping paradise that runs right through the city’s southside. 41. Check out some mind-blowing statues and sculptures along O’Connell Street, the most famous promenade in Dublin. 42. …Then marvel at the city’s most obscure public art piece, the Spire of Dublin, affectionately known as the ‘Stiffy on the Liffey’ (you can guess why), which is also on O’Connell Street. 43. Take a peek at Dublin Castle, which was built in 1230 and now houses government offices rather than mighty giant-like warriors. 44. Get married to someone of the same gender, just because you can—Ireland’s just become the first country in the world to legalise gay marriage after a national vote. Hurrah! 45. Take a stroll around the War Memorial Gardens in Islandbridge, which are some of the most beautiful in Europe. 46. Drop into The International Bar for some top-notch local comedy, poetry and jazz. 47. Eat ALL of the cheese at Sheridan’s Cheese Mongers on South Anne Street. 48. Don’t fall into the Liffey, the river that runs through the heart of the city, after one too many pints (trust us, that one too many happens all to easily in Dublin). 49. Get your nerd on the historic and majestic Old Library, which was built in 1732. That. Is. Old.